North Cyprus has a very long history that actually dates back as early as 8500 BC. This is when the first settlers were known to have arrived on this island. The main reason for this long history is due to the fact that Cyprus is situated in the Mediterranean and was at the time in the middle of all the major trading routes. Cyprus also had plenty of timber and copper which also made it very popular. In order to understand the history of the island we need to explain about all the different civilizations that controlled the island. We will start with the Romans. In 58 BC Cyprus was under the power of the Romans and Christianity began to spread. By 43 AD the entire island was Christian and the proof of this can be seen in the rare mosaic floors that are found in the ancient ruins of the city of Soli. The Romans remained in power until 330 AD when the Byzantine Empire took over. The Byzantine Empire held control of Cyprus for many years and had a definite influence on the country. The castle at Kyrenia was originally built during the Byzantine period. The Five Finger Mountains which are a very prominent feature in North Cyprus were called so after a Byzantine hero named Dighenis who is said to have jumped from Asia Minor to Cyprus and the mountains are his finger marks. Britain was next to take control and in 1191 it was Richard the Lionheart that conquered this island. He was at the time on his way to the crusades in the holy land. King Richard sold Cyprus to the Knights Templar who then returned it before King Richard sold it to a French noble man named Guy de Lusignan. For the next three hundred years the Lusignan family were to rule Cyprus. During this time there were two invasions, one in 1372 by Genoese and one in 1426 by the Marmelukes. In 1489 the last Lusignan king died. When this happened his wife handed power of the island over to the Venetians. The Venetians created many fortresses and used Cyprus as a military base. They also imposed severe taxes on the citizens. The Ottomans overthrew the Venetians in 1571. When the Ottomans took control of Cyprus they outlawed the Catholic faith and the Orthodox Church was introduced. Islam then began to become popular. The Ottomans ruled very successfully for nearly five hundred years and were joined by the British to help keep the Russians away. This happened in 1878 and Cyprus then became subject to the British legal system and government. In 1925 Cyprus became a British colony. After World War II however, the Greek Cypriots who wanted a union with Greece began to gain momentum and fierce rioting and violence ensued against the British. In 1957 the UN help to resolve this trouble by establishing an independent Cyprus. This was further ratified by the Treaty of Zurich in 1960. This treated was to protect the rights of Turkish Cypriots and was signed by Britain, Greece, and Turkey. By 1963 the treaty had failed and civil ware broke out in Cyprus. The UN sent in some troops and what was known as the green line was formed to help to try and keep the peace. In 1974 however things came to a head and the Greek National Guard launched a coup against the president who at the time was Makarios. This coup was to help promote unity with Greece. Complying with the terms of the Treaty of Zurich Turkey stepped in to protect the Turkish Cypriots further dividing the country. The Turkish Cypriots were located in the north of the island. 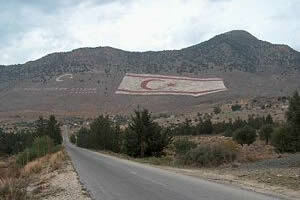 In 1983 the Turkish republic of Northern Cyprus was formed. There was still a lot of hostility and it wasn’t until 2002 that intense talks between the north and the south of Cyprus took place. These talks helped and in 2003 border crossing between the north and the south became a little more relaxed. In 2004 referendums were held on whether or not to form a united island. Whilst the Turkish Cypriots accepted the plans it was rejected by the Greek Cypriots. The island still remains divided today. Southern Cyprus known as the Republic of Cyprus joined the EU in 2004.